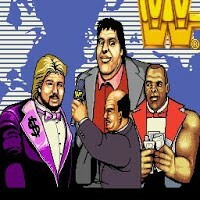 It may have taken a few years but it still wasn’t long before the first few licensed video games started to appear. 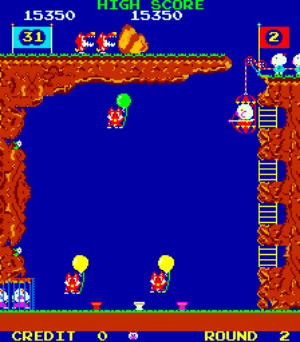 One of the first such games to grace an amusement arcade was this example, by my beloved Sega no less, and was based on the (mis)adventures of Captain Rogers. Well, I say ‘based’ but this is a game that, name aside, has pretty much nothing to do with the source material – something that would become a familiar story in the years to come – but as we all know, that doesn’t necessarily make it a sucky game, just an unfaithful one. 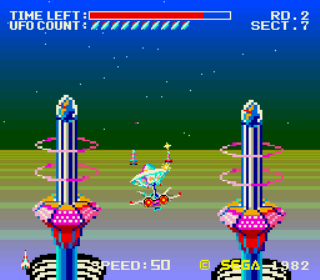 Planet of Zoom, for example, takes the form of an into-the-screen shooter. Nothing unusual there for a 70’s sci-fi show, I’ll grant you – plenty of shooting done in most of those. 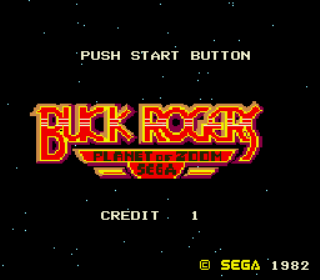 However, as long as it might have been since I’ve immersed myself in the gallant exploits of Buck, Wilma, and Twiki, nothing else from the game seems familiar. Actually, now that I think about it, I can’t even be sure that we’re playing the game as Buck! Oh well, whoever may be at the controls, it’s your job to guide their ship through a tonne of dangerous stuff, and the best means of doing this is by blasting the crap out of it all. To this end, the ship offers unlimited use of its cannon, and you can also move it around the screen freely and increase or decrease its speed as you see fit. Each round is divided into eight stages (or sectors) of which there are three types – trench (as seen in the screenshot to the right), open space (next shot down), and planet (bottom shot) – but the object of each is the same; namely, to either fulfill an enemy quota or to finish within the time limit. If you can take down the required number of enemies before the time expires, you’ll move on to the next stage with any remaining time awarded as bonus points. If the timer runs down before you do this, you’ll still progress but with no bonus. Most of the stages merely pit you against various kinds of oncoming enemies which include many flying saucers, hopping ground-based buffoons, red/purple versions of your own ship (almost), fast winged vessels, and angry-looking grey/red craft. As well as being mighty dangerous by themselves, most of them can also fire missiles and stuff at you, and there are also a few other hazards too. 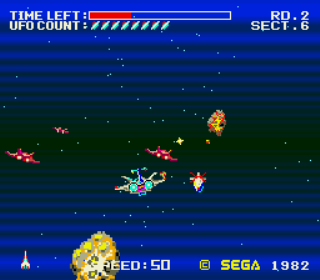 One of the trench stages features a series of barriers with gaps on the left, right, or middle, one of the planetary stages has a load of weird slalom-style gates (which offer only your continued existence as a reward for passing though them), and there is also a stage featuring a much larger boss ship which, for some reason, attacks with its back to you allowing you to simply blast all four of its engines to see it off. Defeating this befuddled clot isn’t too hard and each time you do it’s on to the next round where the stages are in a different order. This process goes on forever as far as I can tell, which means things could potentially get more than a little repetitive. Fortunately, the action is fast and involving enough to keep this from setting in too much. The stages all look the same each time they’re repeated but they work well – the scrolling is pretty fast and the enemies move quickly via some superb scaling. The colouring is also impressive with lovely pixelly explosions, nice shaded skies, and even some occasional eye-melting psychedelic effects on some spacey stages. The sound is a little more basic, consisting only of a constant blooping sound (the ship’s engine? ), as well as shooting and explosion effects. They’re loud though, and do contribute to the enjoyment of Buck’s adventure which is a pretty decent one. 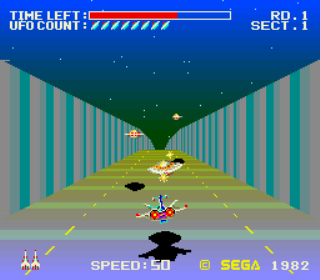 I think it’s clear Sega’s inspiration for Space Harrier lies here, and the later game is understandably the one that’s more fondly remembered, but I was pleasantly surprised by its spiritual predecessor which is more playable in some ways as well as being slightly easier. Buck and friends may have a pretty limited involvement but they can still be fairly proud of this.